We’re excited to bring the series to a new (for us) venue. The City Winery’s Upstairs Lounge has comfortable seating and great acoustics, and patrons can enjoy a wonderful dinner with drinks while seeing the show. Doors open at 5 pm and the concert begins at 7 pm. Unlike previous Great Album concerts, there will be only one performance for this series. Tickets are $20, $15 for TJBS members. The classic 1963 recording was the first time Coltrane and Hartman had performed or recorded together, though the two had known each other since the 1940’s. The record was Coltrane’s idea, and Hartman was reportedly hesitant at first because he didn’t consider himself a jazz singer. The album consisted of six tunes, including versions of “My One and Only Love” and “Lush Life” that are considered definitive. 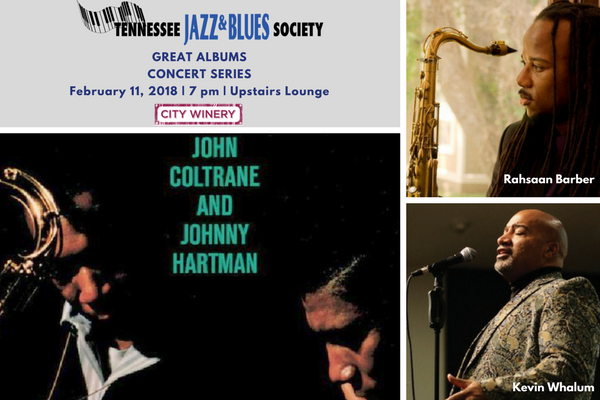 The pairing of Rahsaan Barber and Kevin Whalum for this date is an inspired choice that mirrors the original Coltrane/Hartman pairing. Barber, a longtime Nashville favorite, is an adventurous improviser who cites Coltrane as one of his many influences. Whalum (brother of saxophonist Kirk Whalum) is best known for his contemporary jazz work, but is also an outstanding interpreter of straight-ahead jazz, and ballads are a particular forte. Tickets are available online through the City Winery website and at the door. TJBS members will be receive an email with a special discount code, but must purchase tickets in advance to receive the discount (members, please contact us if you don’t receive an the code by email). Click City Winery’s logo below to purchase tickets. Unlike previous Great Albums Concerts, there will be only one show, so advance purchase is strongly recommended!